The Internet Archive's Wayback Machine is one of the resources that I have included in my presentation about search strategies and fake news. I include it because it is a tool that can be used to see how a website or a specific webpage has changed over time. As is demonstrated in my video embedded below, you can use the Wayback Machine to see how a website looked and read the text of pages as they were originally published. 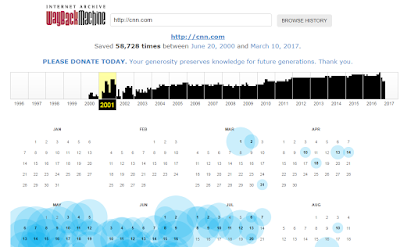 Another interesting way to use the Wayback Machine is to look at how major news websites reported on significant events in late 20th Century and in the 21st Century. Not only does the Wayback Machine show you the text, it may also show you images that may have since been removed.